This is a small, fascinating, superbly researched show, about a subject that deserves treatment in a major institution. It's not just the Bay artists' links with New York that are ripe for further exploration, but also those with the School of London figurative painters (Francis Bacon et al) - not to mention San Francisco's Beat writers. Only two of the artists featured in the exhibition are familiar to Londoners: Richard Diebenkorn was the subject of a 1991 exhibition at the Whitechapel Gallery, and Hassel Smith, who moved to Britain in 1967, is represented in the Tate Collection. The exhibition at Williams Fine Art will introduce the British public to a sampling of works by Bay Area masters well known in the U.S. -- including David Park, Elmer Bischoff, and Frank Lobdell -- and also to abstractions by Ernest Briggs and John Grillo. In conjunction with the show, Williams has written a new book that challenges the dominant narrative of postwar American art: he sees California as the "alternative birthplace" of Abstract Expressionism. As he likes to point out, the revolution in painting began early in the Bay Area when large numbers of discharged GIs entered the California School of Fine Arts -- run by a very progressive director named Douglas McAgy -- at the close of World War II. Williams' book features a small 1964 self portrait by Nathan Oliveira, who attended art school on the GI Bill, on its cover. Concerned that the achievements of the Bay Area School have been "relentlessly written out" in deference to those of east coast artists, Williams is determined to narrate the crucial role California artists played in the evolution in Abstract Expressionism as well describing their accomplishments in developing new forms of figurative painting. I was recently able to interview Thomas Williams and learn more about his passion for Bay Area art and his continuing research. Thomas Williams Can you tell me how you became aware of and interested in Bay Area painting? 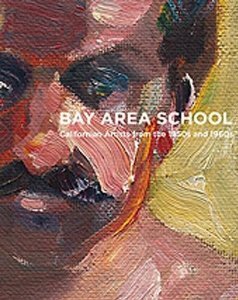 I started to make regular visits to the Bay Area in the late 1980s and became aware of the contribution made by certain key artists in the period immediately after the War, especially Richard Diebenkorn, Elmer Bischoff, Frank Lobdell and David Park. RICHARD DIEBENKORN Untitled (Albuquerque Series) 1951 Oil on canvas 17 × 15 1/2 in / 43 × 38 cm Diebenkorn was the first artist to catch my eye, partly because of his extraordinary contribution to almost every area of graphic art, drawings in pencil, chalk and ink, gouaches, watercolours and prints. There was an intensity and a willingness to take risks and explore the media which was more evident to me in his drawings than his paintings. He never lost that sense of discovery in his works on paper, even at the very end of his life. And since I had been specializing in works on paper at that time I was immediately attracted. My enthusiasm for his work is completely undiminished by years of study. 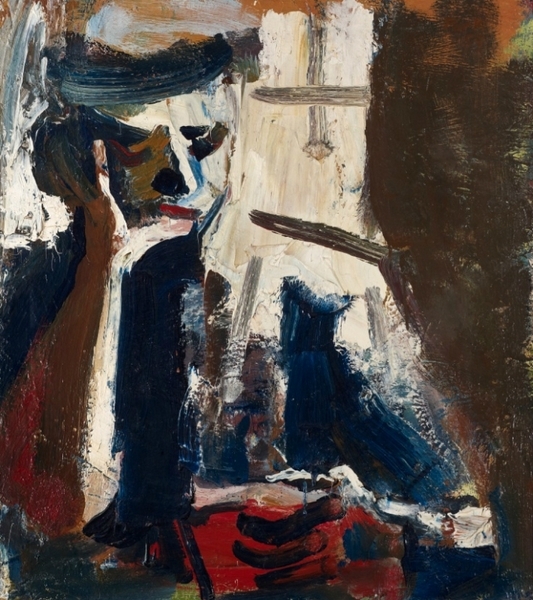 DAVID PARK Woman Reading 1958 Oil on canvas 44 × 38 1/2 in / 112 × 97 cm Later on, I discovered David Park, a real 20th century hero, who greatly influenced Diebenkorn in the 1950s. I then became familiar with the others of the school. 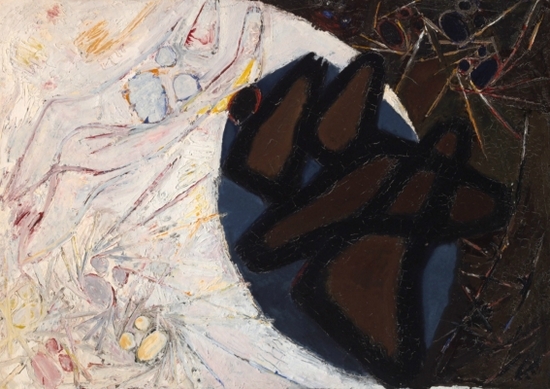 JOHN GRILLO Untitled 1953 Oil on canvas 12 × 24 in / 30 × 61 cm An astonishing discovery was the work of John Grillo. He came to San Francisco from Okinawa at the end of the War with the de-mobilised GIs and by 1945 was throwing and dripping paint on his canvasses in a remarkable variant of Free Form Abstraction. 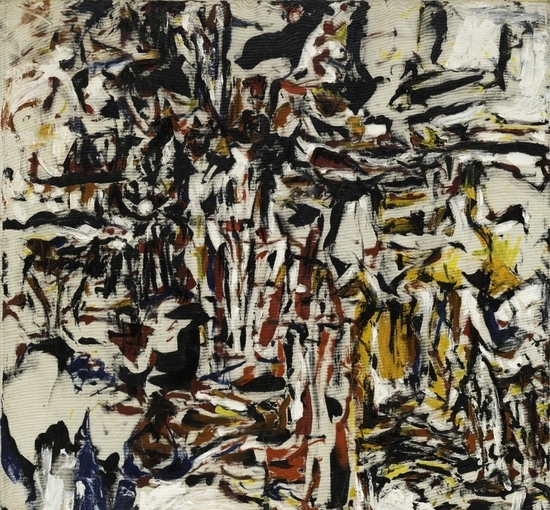 He was one of its pioneers in the United States, contemporary with Pollock, but earlier than virtually any of the others either on the east or west coasts. Your exhibition has been getting some great press including a glowing full page review in the Sunday Telegraph. Can you tell me more about the reactions you are getting from Londoners? The response has varied from ecstatic to bemused. The very term 'Bay Area' created some difficulties - for instance, one comment was to the effect that the show wasn't to the viewer's taste because they had never really liked Morcambe Bay! (a seaside resort in northern England). On the other hand, the response from the Art Press and from critics has been overwhelmingly positive, with many commentators wondering why such a show had not come to the public art galleries. We have had more visitors to this show than almost any previous show. 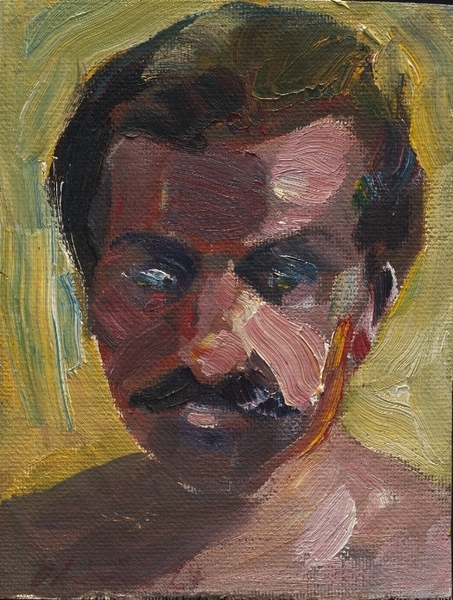 NATHAN OLIVEIRA Self Portrait 1964 Oil on linen 8 × 6 in / 20 × 15 cm Other than a 1991 Diebenkorn exhibition at the Whitechapel Gallery, is it fair to say that the British public has had very little opportunity prior to your show to see works from the Bay Area Figurative tradition? This is quite correct - there has been no exposure to the work of these artists in the UK through exhibitions and there are virtually no works in British public collections. 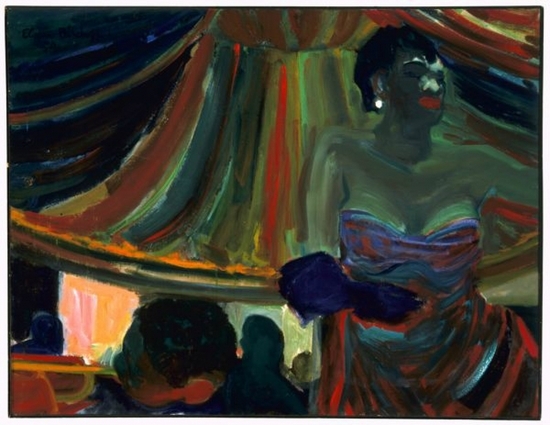 ELMER BISCHOFF Blues Singer 1954 Oil on canvas 55 × 72 in / 140 × 183 cm You have been doing some research and also have published a new book: The Bay Area School, Californian Artists from the 1940s, 1950s and 1960s. What have been been learning as a result of your research. There are two aspects which have particularly fascinated me. The first is the extent to which these artists were written out of the post-war Abstract Expressionist movement by the New York critics such as Clement Greenberg, even though they were deeply involved from the outset. It is now almost invariably assumed that San Francisco was not producing artists from this school until some time in the 1950s, whereas there was a flourishing school in San Francisco from 1946. 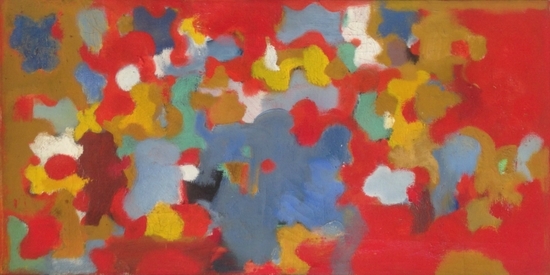 Indeed, by 1952 the west coast school of Abstract Expressionism had virtually dispersed. 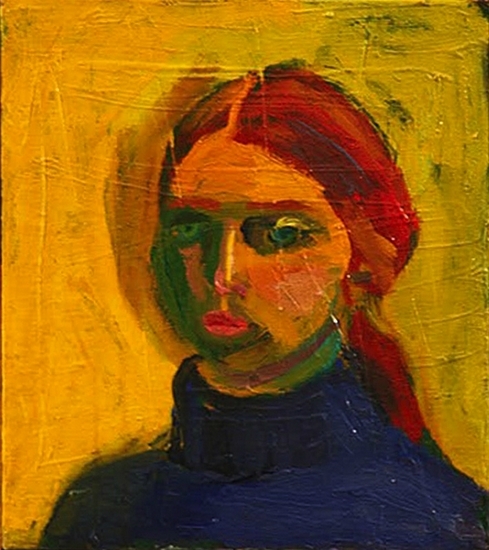 JOAN BROWN Self-Portrait c.1960 Oil on canvas 15 × 13 in / 38 × 33 cm The movement in the Bay Area was short-lived but very intense. The artists were cloistered together at the California School of Fine Arts with their teachers, who it must be remembered included Mark Rothko, Clyfford Still and Ad Reinhardt. This resulted in a form of painting that was unique to the Bay Area, but was definitely within the terms of Abstract Expressionism. 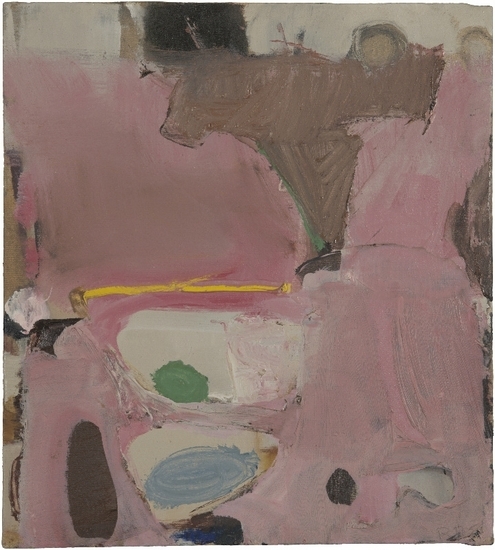 ERNEST BRIGGS Untitled 1952 Oil on canvas 44 1/4 × 47 3/4 in / 112 × 119 cm The second aspect which has impressed itself on the study of that period is the extent to which the San Francisco artists transmitted their discoveries back to the east coast. Edward Corbett, for instance, was an crucial influence on Ad Reinhardt, who shared a house with Corbett in Richmond, CA at the end of the 1940s. Clyfford Still had a powerful influence on Mark Rothko, who made numerous visits to San Francisco in the 1940s and stayed for prolonged periods with Still while he was teaching at the CSFA in 1947, 1948 and 1950. Are you seeing connections between postwar California painting and British painting from the same era? The ideas that went back to England from the Bay Area really started with the advent of the Beat artists in the 1950s, for instance. And it is fair to say that the School of London had little to offer the Bay Area until those artists broke away from abstraction into figuration, led by David Park in 1950. At that time the work of Francis Bacon offered a shining example of how to get away from abstraction without retreating into Realism. His work was certainly on the radar of the figurative Bay Area artists in the 1950s. FRANK LOBDELL April 1967 1967 Oil on canvas 22 × 31 in / 56 × 79 cm How does it feel to have this show on your gallery walls? The opportunity to exhibit the work of the Bay Area school of the 1940s and 50s for the first time in the UK is something to treasure. It is only around 70 years late, after all. My admiration for the courage of these artists is unbounded, especially when you consider that there was no art market in San Francisco at the time they were painting and virtually no local collectors of contemporary art. The commitment of these artists to their work, against all the odds, is a constant source of inspiration.